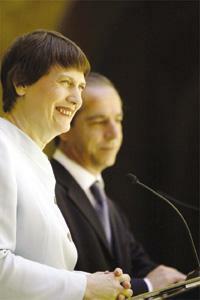 Prime Ministers Lawrence Gonzi and Helen Clark during their joint press conference yesterday. Malta and New Zealand yesterday signed a working holiday scheme through which young people can spend up to a year working and travelling in each other's countries. The agreement was announced after talks between New Zealand Premier Helen Clark and Prime Minister Lawrence Gonzi at Castille. Ms Clark is heading a delegation on her way to Italy to attend events marking the 60th anniversary of the battle of Cassino. She invited Maltese workers to help New Zealand plug the shortage of workers who pick fruit. "So there will be times of the year when Maltese holiday makers will find no difficulty in working and paying for the fare to New Zealand. We need all hands for fruit picking at certain times of the year," she told a press conference after meeting with Dr Gonzi. The working holiday scheme, to take effect later this year, provides for an annual quota of up to 50 young travellers from each country to visit and undertake short-term employment. New Zealand has some 30,000 places available each year for working holiday agreements with another 11 countries. Addressing the media, Dr Gonzi said Malta's relationship with New Zealand was very strong, having been built over many years. "New Zealand will have a friendly country receptive of its interests during our work as members of the EU." Dr Gonzi said talks with Ms Clark centred on topics that included the possible finalisation of an agreement to regulate social security issues between the two countries. Substantial progress had been registered in talks in recent months and it was expected that an agreement could be concluded over the next few months following more talks, he said. The possibility of an agreement on the avoidance of double taxation was also discussed, as was the forthcoming Commonwealth Heads of Government Meeting to be held in Malta from November 25 - 27 next year. The secretary general of the Commonwealth, Don McKinnon, will be coming to Malta in the coming weeks to discuss the meeting. Ms Clark also spoke on the good relations between Malta and her country. "But it was Malta's entry into the EU which has caused New Zealand to reckon it was time to freshen up the relationship with a very old friend in Europe." New Zealand had developed very strong arrangements with the EU and "we know we can count on Malta as an old friend at the EU table being well versed on what New Zealand's needs and interests are". She told President Eddie Fenech Adami during lunch that the EU was New Zealand's second largest trading partner and the country was looking forward to having another good friend in the Union. Asked whether investment by New Zealand Post through Transend in Maltapost had been discussed with Dr Gonzi, Ms Clark said the issue was raised during the meeting as this was probably the most substantial investment by New Zealand in Malta. However, Transend was a fully commercial company and was not under government direction. Ms Clark met the Leader of the Opposition, Alfred Sant and paid homage to fallen servicemen by laying a wreath at the Pietà military cemetery and met Maltese businessmen and industrialists at the Chamber of Commerce and Enterprise, in Valletta.